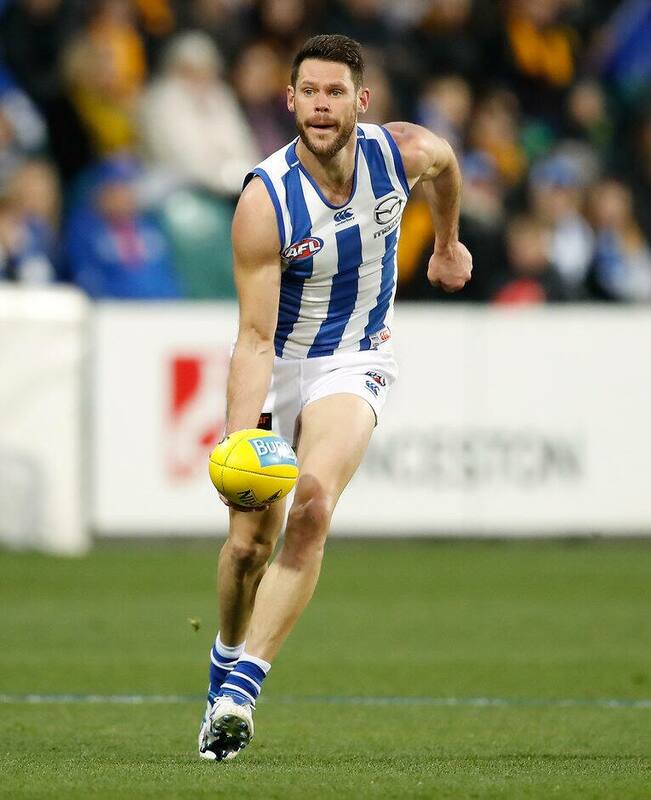 NORTH Melbourne veteran Sam Gibson, the owner of the AFL's longest active consecutive games streak, has been delisted. Gibson, 31, has not missed a game since debuting for North in round 12, 2012, against Gold Coast, and extended his unbroken streak to 130 games in the Roos' round 23 win over the Brisbane Lions. The hard-running midfielder has been one of the Roos' most consistent performers in recent seasons, recording top-10 best and fairest finishes in four of the five full seasons he played: he finished ninth in 2013, seventh in 2014, third in 2016 and seventh this year. Despite his solid form and desire to play on, Gibson was informed on Friday his time at Arden St was up. Gibson averaged 22.1 disposals a game in 2017 (fourth at North, behind Ben Cunnington, Shaun Higgins and Jack Ziebell) and was ranked seventh at North for rebound 50s (45) and tackles (71), and eighth for inside 50s (48). His enormous work rate during games has also shown no signs of waning, while he continued to dominate North's pre-season time trials. Given his durability and the late start to his AFL career, Gibson is keen to play on at another club. He will become available as a delisted free agent later this month. North coach Brad Scott paid tribute to Gibson's six-year stint at Arden St on Friday. "Sam is without question one of the most determined and dedicated players going around," Scott said. "It's a credit to him that he was able to begin his career late, as a 25-year old rookie, and become an integral player at the elite level for us. "His durability, leadership, strength of character and persistence has all helped create one of the truly great and inspirational football stories. "Other mature-age players and AFL aspirants should look at Sam's journey and take a lot confidence from it. "Sam has been a pleasure to coach and he will be missed." North recruited Gibson from the Box Hill Hawks in the 2012 rookie draft. He had earlier spent 2007 on Hawthorn's rookie list.